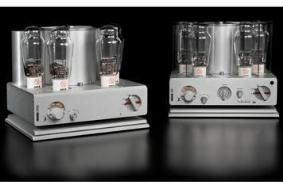 CES 2011: Nagra launches high-end valve integrated and power amp | What Hi-Fi? Both use the 300B triode valve, first introduced in 1938, in a push-pull configuration to develop 20W per channel. The amplifiers are designed to give consistent performance with all the various versions of the 300B still on the market, and are handbuilt by the same teams responsible for the manufacture of the company's professional recorders. The circuitry uses multilayer epoxy-glass boards with gold plated tracks to military specifications, selected components throughout and a star-earthed design. The 300i integrated amp has four inputs – three on RCA phonos, one on XLRs – high-quality relay switching, and volume and balance controls driving motorised Alps Blue Velvet potentiometers. Remote control is also provided. Soft-start circuitry is used on both units, along with self-diagnosing protection, which also monitors for short circuits or output overload. The amps have anodised aluminium casework, and Pyrex sleeves to protect the valves, and are supplied with Nagra VFS vibration-absorbing plates which sit below the units as part of a two-stage isolation system. Nagra products are distributed in the UK by RT Services.